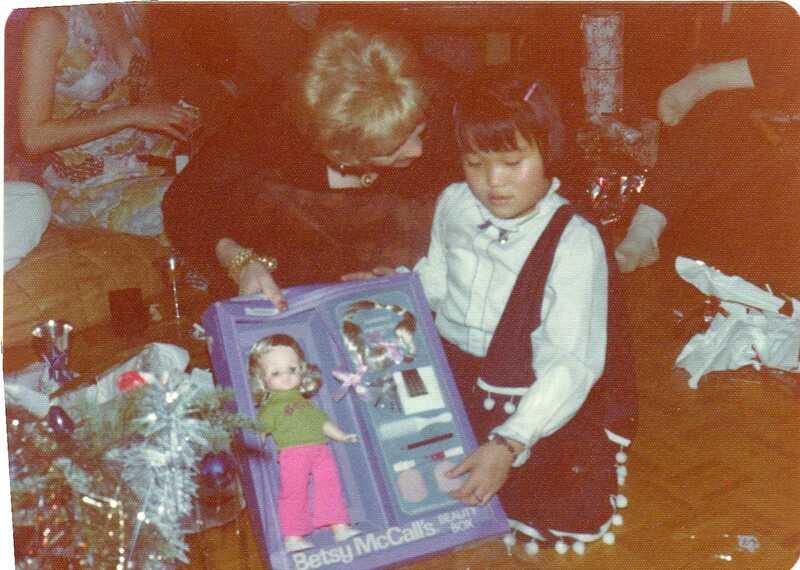 It brought me tears as I recall my own life as an adoptee…. 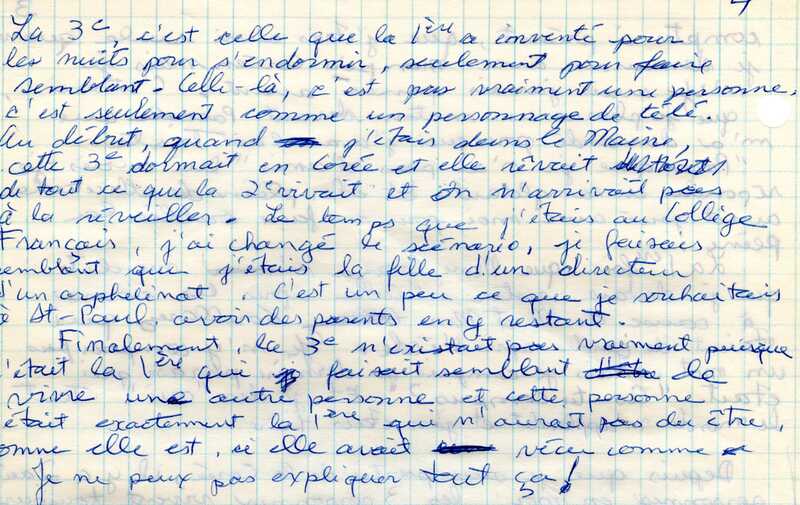 The following are excerpts from my memoir/diary that I wrote about 25 years ago when I was in my 20s. This is actually a third version of my memoir/diary. I had written the first version during my teen years but destroyed it by fear someone would read it; I also destroyed the second version while re-writing this version to be read by my doctor who had encouraged me to put my life on a paper. It’s in French, so I translated it below with comments in italic if needed. “Since I left Korea, there are 2 other persons in me: the 3 persons live always together but people only see/saw one person. There is me, the real Kim Myung-Sook who lived in Korea. When she came, she was not the one my mother wanted. My mother wanted a living doll, a baby to cuddle. That’s why, for my mother, there’s a 2nd Kim like the one my mother wanted. The real me, the one who was born in Korea, she knows what real life is, she knows life is sad and she sometimes feel she’s too old; she lives in the real [life] while hating the real et she leaves the place to the second Kim. The second Kim is the one everyone knows [of me]. She was a baby when she came, she became older with moving house [from Maine, USA to Quebec, Canada], she became older but she’s of her real age. [I meant that everyone paid attention to me and treated me as if I was a baby. But less than six months later I was seen as a girl of my age because I had grown up and nobody cared about me], she’s lucky to have all the material comfort, lucky to be adopted. She’s a child who doesn’t suffer. She’s the one who hides the truth when the 1st wants to show up. This one, she evolves normally as expected by everyone. The 3rd is the one that was invented by the 1st for the nights to fall asleep, only to pretend. This one is not really a person, it’s only like a TV character. At the beginning when I lived in Maine, this 3rd was sleeping in Korea and she was dreaming everything the 2nd lived and nobody was able to wake her up. 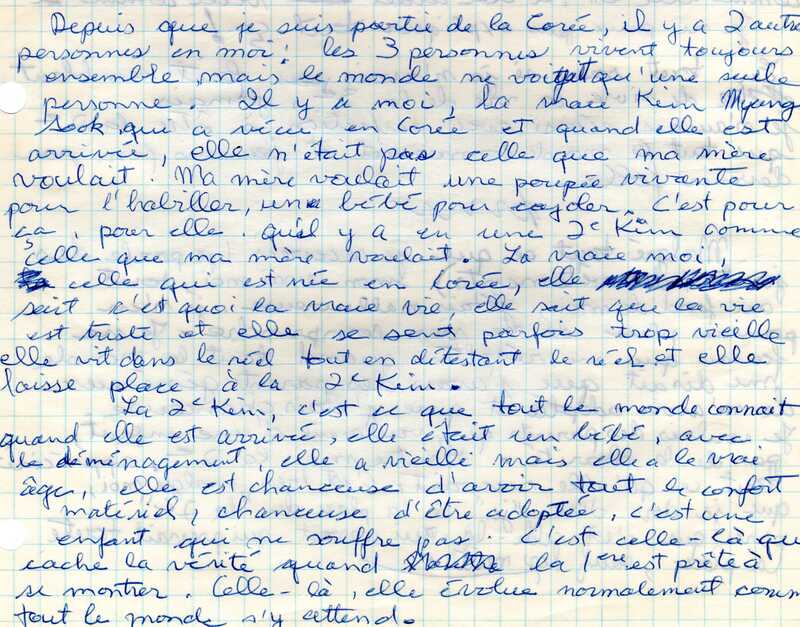 [I meant that I pretended to be asleep in Korea and that everything was only a dream or a nightmare] When I was at Collège Français [a primary school], I changed the scenario, I pretended to be the daugther of an orphanage director. It was a little what I wished when I lived at St. Paul, to have parents but to stay there. I can not explain everything! 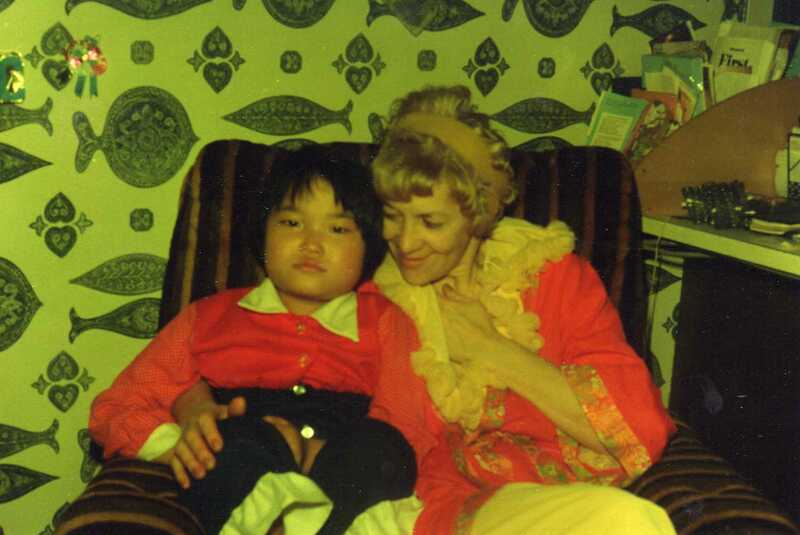 Today I would say all this differently: adoption killed the Korean in me and adoption created the Quebecker in me. The title of this post was inspired by that of an article published in 2013 in BBC News Magazine, The adults who suffer extreme homesickness, which describes the struggles adults have coping with homesickness. Spanish footballer Jesus Navas, for instance, suffered from homesickness so severe it induced panic attacks that kept him away from training camps and pre-season tours. It is said he has overcome his homesickness through counselling. 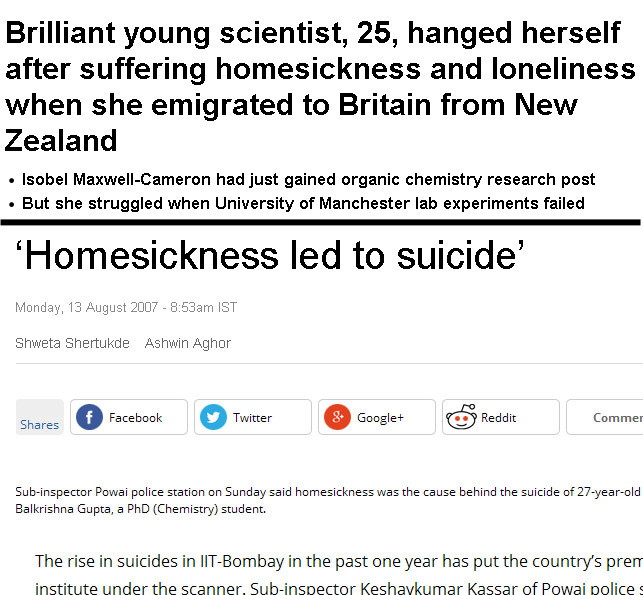 I found the article while searching for “homesickness, depression & suicide”. I was led to search on this subject because when you belong to an adoption group you cannot avoid the subject of suicide and while reading the study according to which adopted offspring are nearly 4 times more likely to attempt suicide than nonadopted offspring, I recalled the story of The Little Prince and the word hiraeth. The Little Prince is one of my favorite books. Little Prince commited suicide by receiving the snake’s venomous bite to return home and to be reunited with his beloved rose (“I can help you, some day, if you grow too homesick for your own planet,” said the snake). 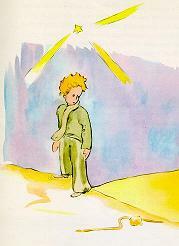 [See my blog post The Misunderstood Little Prince]. Homesickness in adopted children is overlooked or ignored. When I watched the documentary Mercy Mercy [link and link], which featured the heartbreaking story of two Ethiopian children, Masho and Robba, adopted by a Danish couple, I recognized in Masho a little girl I once was suffering from homesickness. Homesickness in French is “mal du pays” (literally “country-sickness”). Despite the way it’s coined, homesickness isn’t necessarily about home (neither about country). When you’re homesick, you’re not literally just missing your home, you’re missing what’s normal, what you’re familiar with, the people you love. I felt homesick and axious the same day of my arrival to America when I first met my adoptive parents (whom I had named “the yellow-haired woman and her fat American man”) at the airport. My arrival day (or “the day I got you”, as my adoptive mother would say) was on December 2nd. Less than three weeks later I cried the entire evening during their Christmas party with their employees. To console me, the yellow-haired woman gave me the gift which should have made me happy: it was a doll I fell in love with during my first Christmas shopping in America (the first toy I ever wanted that she had pretended to refuse and she had put it back on the shelf) but I was inconsolable. I cried while unwrapping it and continued to cry while everyone around me was dancing, drinking, celebrating, and speaking aloud. I was scared of being in the middle of strangers. I was homesick. I missed home (orphanage). I missed my country. I missed my friends, the nuns, the caretaker. I missed foods. I missed everything I was familiar with and everyone I loved. But my homesickness was ignored. A friend of the yellow-haired woman took a photo of us. The American who took the photo attributed my cry to fatigue. He said to me as if he was talking to a baby, “…. tired, tired… tired..” , while another was saying, “… spoiled,…, spoiled…” And he put me on pajama and to bed, but the yellow-haired American took me with her because I kept crying in my bed. At the end I sobbed and then I pouted while she tried to console me. And the American ‘photographer’ took another photo of us. It was still a mild form of homesickness. I was a happy child despite being homesick and being eager to return home (house where I lived with my father). I was told that they (first orphanage staff, and then the second orphanage driver-director) would search my home (I had given them my former home address). From my understanding of adoption, I would go back to Korea to my father after staying for a while with the American parents. Thus my homesickness was similar to that of a child in a summer camp, aggravated by being in an entirely different environment people, culture and language. But the homesickness grew deeper. I became melacholic and very nostalgic of my birth country less than a year after my adoption. As it grew deeper it became hidden, invisible and was never noticed by anyone…. Homesickness is a too weak word to describe adoptees’ feelings. I attempted suicide many times during my teen years and in my early 20s. I was 13 at my first attempt. I also attempted and thought of attempting suicide in my 30s, until I joined an adoptees online group in my late 30s. I remember feeling an intense nostalgia, longing for something, for a missing something during those years, but I didn’t know and was unable to identify what I was nostalgic of, what I was missing or longing for. But homesickness is a too weak word to desbribe my feelings. Nostalgia, longing, yearning are not the right words either. I found the right word just this year, at 49. That feeling was/is hiraeth. from Facebook page, Is Adoption Trauma? Hiraeth bears considerable similarities with the Portuguese concept of saudade. 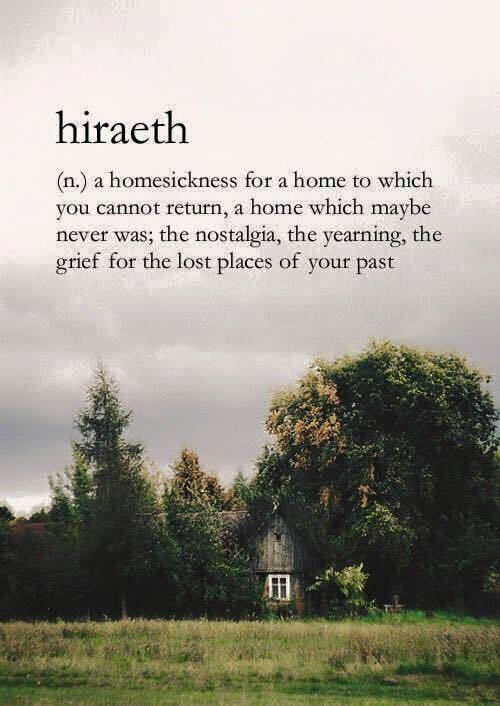 Hiraeth is a word that describes many adoptees’ feelings. I first saw it on my Facebook Newsfeed. It was posted by Sunny Jo, a Korean adoptee and the author of the book From Morning Calm to Midnight Sun. Since then it was posted, shared, liked or commented by many adoptees on their timelines and in FB adoption groups or pages (and most likely other online groups). I also wrote two posts related to my feeling of hiraeth on this blog [link and link]. For instance the image above comes from the Facebook page, Is Adoption Trauma? Hiraeth is much more than homesickness [link].